Many Metro Atlantic PPFA framers travelled to attend the New England PPFA FrameCon event. Framers from New Jersey, Pennsylvania, and New York were enthusiastic to participate in the two day conference. The New England framers welcomed us and we hope to attend in an even greater capacity next year! Here are the results of our recent election. Thanks to all that voted and thanks to our Nominating Committee of Lauren McManus, Lisa Dromsky and Brian Williams. Cliff Safane, Co-Managing Partner of Frametastic! LLC, is now the PA representative for Designer Moulding, a leading manufacturer of wood and metal moulding. In addition to Designer, Frametastic represents Bella/Prisma, Nelson, and FPF Mouldings as well as its own line of moulding and photo frames in various North Eastern states. Members of Metro Atlantic PPFA took part in West Coast Art and Frame, The National Conference, and PPFA events January 23-27, 2016. Susan Gittlen MCPF of Whispering Woods Gallery and Lauren Rosenthal McManus CPF of Ampersand Projects represented Metro Atlantic PPFA during the two day PPFA Chapter Leaders meetings. Metro Atlantic PPFA showed their great spirit at the PPFA “Meet and Greet” event giving out James Salt Water Taffy and “Greetings From Metro Atlantic PPFA” postcards. A slide show was played to show previous Chapter events. Thanks to Larson Juhl for donating a chalkboard frame for our slideshow, and thanks to Lauren for decorating it. Metro Atlantic PPFA framers toured CCAHA, the Conservation Center for Art and Historic Artifacts on November 2, 2015. We met with staff from departments and toured the facility. After we walked to Ursula Hobson Art and Framing and toured her retail area and workroom. To end the day the framers enjoyed dinner at La Viola West Restaurant. Click on any photo below to view larger. Threats of inclement weather did not stop twenty framers from gathering at the Spoke Works in Lambertville, NJ on October 4, 2015. We learned how to create fabric wrapped mats from Bonny Lyttle, award winning framer from Picture Perfect in Toms River, NJ. We visited Ampersand Projects, shop of Lauren and Darren McManus. Mo Elyas spoke about Shipping 101 and his new app FrameMe.com. Congratulations to Kristen Birdsey of Jerry’s Artarama in Lawrenceville, NJ,who won first place in the Metro Atlantic PPFA print competition. We were delighted to hear news of PPFA and the industry from Bruce Gherman of Picture Framing Magazine and PPFA. Thanks to TruVue, Frametastic, Larson Juhl, and Peterboro for donating door prizes. Thanks to all who came out. Congratulations to Penny Safane of Frametastic for passing the CPF exam. Penny is co-owner of Frametastic! LLC in Ringwood, New Jersey and is an enthusiastic member of Metro Atlantic PPFA. Perhaps the session with the Etsy Owl in Brooklyn helped her ace the exam! Any picture framer who has a minimum of one year of hands-on experience in retail or wholesale picture framing may apply for the certification. CPF exams are held once a year in Metro Atlantic PPFA, usually in August. The CPF exam can also be taken online. Also a candidate may sit for the CPF exam at the National PPFA Convention in January in Las Vegas, Nevada. For more information on the CPF exam please contact PPFA National. It is an exciting time for the new PPFA. We are looking forward to rebuilding a better trade association. During this time of growth and change, it is only natural that we face challenges as well. I recognize that change is difficult, but these challenges provide us with new opportunities. The PPFA was started over 40 years ago, before social media, online banking, and the Internet even existed. The way that we do business has also changed and expanded. Custom picture framing is not only offered as a service from independent retailers, but also through big box stores and online retailers. The way we look at membership is changing as well. It’s the perfect time to look at the way we handle membership with the goal of reducing cost, man-hours, and putting emphasis back on promoting custom picture framing. Had we remained with PMA and their new pricing structure, it would have been based on annual sales volume. There were many complaints from both retailers and suppliers alike that led to refusal to join. This pricing strategy encouraged inaccurate information since some retail business owners might not want to share that type of information and choose a lower price bracket than appropriate. This new procedure is a simplified, less costly, and fair way to represent all businesses. In the past, we measured our membership by the number of shops, not members. The benefits and services, such as continuing education, CPF and MCPF certification programs, need to be tracked by individuals, not shops. Ballots need to be signed by individuals. With a new and improved database, we can accomplish this goal efficiently and accurately. Operating a membership-based trade association, it is a priority to capture all named in the membership. This sign-up method also helps us to establish better industry statistics. Media sources frequently call for information about our industry. At the current moment, we cannot accurately reflect our group dynamics. Finally, there is strength in numbers. The new PPFA will work to provide the best discounts on services and products and the number of shops does not represent the true association size. We will have better negotiating ability with this accurate member count. I encourage you to join me in my enthusiasm about the future of the new PPFA. The changes that you are going to see are positive ones. Stay tuned – exciting things are happening. Renew your membership today. Our August meeting in Brooklyn covered all the bases of what hand-crafted means in today’s world. It also showed us how technology has advanced our knowledge, not only of preservation standards, but also of how to reach a world-wide audience with our work. At Talas, a family-owned and operated company that’s been around for more than 50 years, we experienced the collision of tradition and innovation. From upscale handmade European papers and leather tools to the state-of-the-art Zund digital cutter and new paper-thin, UV-safe light technology, this conservation supply house really does have it all. They represent the finest materials and highest standards of conservation quality, serving museums, libraries, and, of course – custom picture framers like us. Operating with only 11 employees, Talas impressively embodies the qualities of “small is beautiful.” We toured their warehouse, showroom, and educational facilities, where they plan to start holding regular demonstrations and classes related to the materials they carry. East-coasters with a proximity to New York – look out for updates about their offerings; a hinging demo is currently in the works. A few miles away at Etsy, we entered what seemed like another universe. This billion dollar publicly traded company is only 10 years old and has several hundred employees. The work culture is youthful, fun, and tech-oriented. A tour of the offices revealed a sea of computers surrounded by unique and playful art objects, a cereal bar, and conference rooms creatively named and decorated after bands paired with foods (i.e. Sushi and the Banshees and Nine Inch Snails). We were given a presentation about how to use their platform to open our own online shops, selling frames, matting, prints, and other handmade goods to folks well outside of our local region. Many of us already use this technology to expand our customer base, and tips were shared about how to be more effective. All in all, the day was informative and stimulating, both to our tactile senses at Talas and to our business brains at Etsy. Many of us came away with supplies and tools for advancing our shops. Thanks to Lauren Rosenthal McManus of Ampersand Projects for the recap of our meeting. 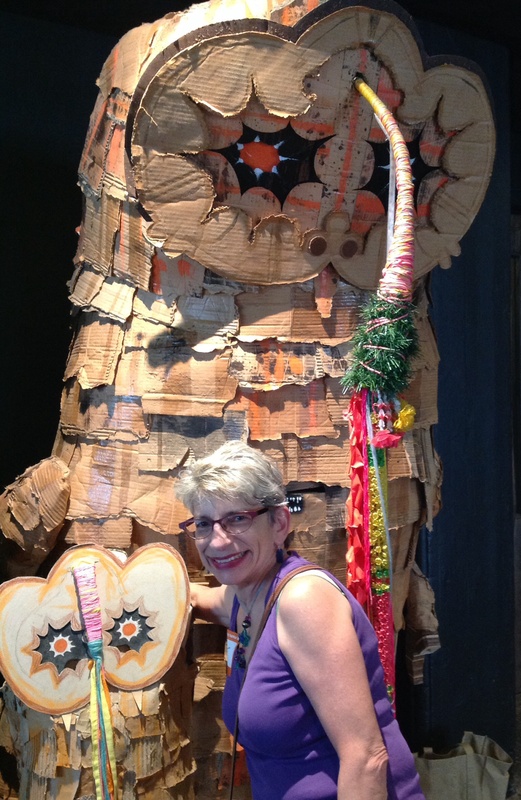 A great visit to Talas! Penny and Cliff from Frametastic! We are excited to announce that effective immediately PPFA has become part of Monarch Expositions, owned by Deborah Salmon and Bruce Gherman, principals of the West Coast Art & Frame Expo and publishers of Picture Framing Magazine. As many of you are aware, the past several months have been a time of significant transition for PMA. It has always been PMA’s goal to provide an excellent level of service to all our members. After a long period of gathering information and analyzing the best ways for us to serve our membership, the PMA Board of Directors voted in May on new strategic initiatives for PMA. Because the newly established strategic initiatives are directing us to focus our full attention on our core members – businesses in the photo imaging space – we made the decision to look at other avenues to ensure PPFA members would be well served and have their needs catered going forward. We could not have asked for a better new home for PPFA than Monarch Expositions. As you know, PMA has partnered with the leadership of this excellent organization for the past few years, co-locating the PPFA conference with the West Coast Art & Frame Expo and National Convention. Just as the photography industry is PMA’s core focus, the framing industry is theirs. We are very confident this move is in the best interest of both PMA and PPFA members. Your membership in PPFA has always been a part of your membership in PMA. You will therefore remain a PMA member and afforded all membership rights and benefits for the duration of your membership year. We recognize several PPFA members are involved in both the photography industry and the framing business. For those in that category, we are joining with our friends at Monarch Expositions to create a special discounted package for dual membership in both organizations. More information about this membership arrangement will be forthcoming. In addition, Monarch Expositions will be announcing a transition team comprised of key members of the framing industry to make this transition seamless for PPFA members. If you have any questions about what this transition means for your PMA membership, please don’t hesitate to reach out to Member Services Coordinator Sibley Guilianelli at sguilianelli@pmai.org, or by calling 703-665-4416. For questions regarding your PPFA membership, contact Maureen Robertson at mrobertson@hobbypub.com. We look forward to the future of PPFA and PMA and thank you for your support during this exciting time! November 2014-Congratulations New CPFs! A hearty congratulations to two Metro Atlantic PPFA members that recently passed the CPF exam. Congratulations to Lauren Rosenthal CPF of Ampersand Projects of Lambertville New Jersey and Stephen McMillion CPF of Redbank Frameworks of Redbank, New Jersey. More than 3,800 individuals worldwide have achieved CPF status since the program’s inception in 1986. Any picture framer with a minimum of one year of hands-on experience in retail or wholesale picture framing may apply for certification. 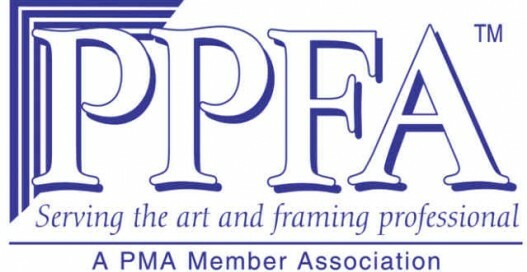 For more information about the Certified Picture Framer designation, visit the PPFA website. June 2014-Don-Mar Creations is pleased to announce the appointment of Mark Butwinski to the position of Operations Manager of the Don-Mar Moorestown, NJ facility. Mark brings over 30 years experience serving the framing industry as the former General Manager of M&M Distributors, and President of Inmes-USA. Mark is known throughout the picture framing industry for exemplary service, product knowledge, and recommending the best equipment for a customers particular needs. Don-Mar of New Jersey services New Jersey, most of Pennsylvania, Delaware, Maryland, and as far south as Richmond, Virginia with deliveries in their own trucks. On April 21, framers visited Rago Auction House and the studio of Conservator Christyl Cusworth. 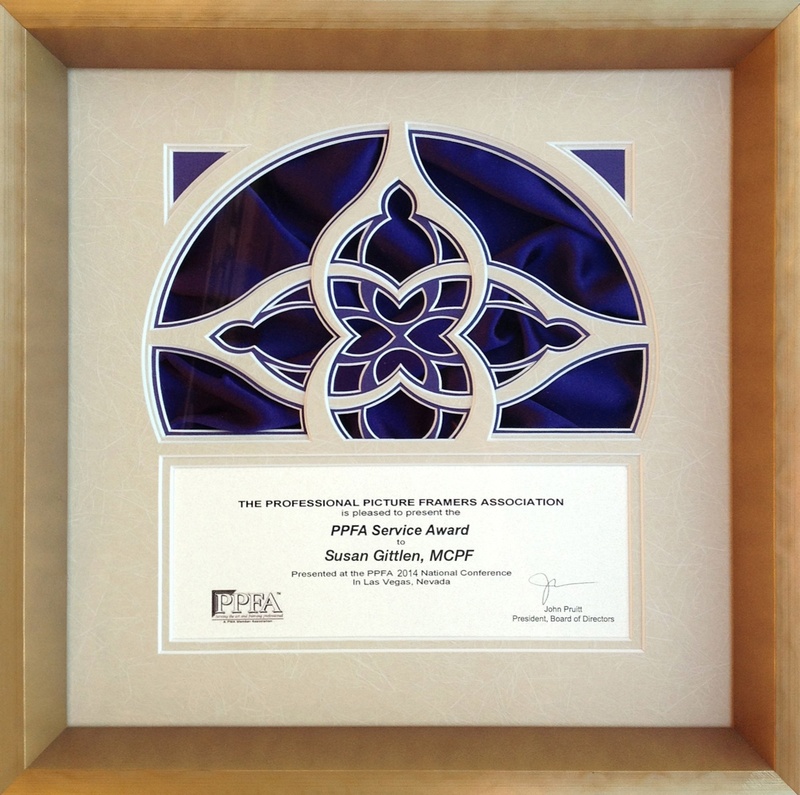 Susan Gittlen MCPF was awarded the PPFA Service Award in Las Vegas, January 2014. Susan Gittlen of Whispering Woods Gallery Holland, Pennsylvania has been a PPFA member for 27 years, holding a leadership position since 2005; and is an MCPF. Sue served as president of the New Jersey/Delaware Valley chapter for two years and for the past year served as treasurer of the Metro-Atlantic chapter. For the past eight years, she has been chapter librarian and webmaster, and is a chapter competition judge. She launched the Metro Atlantic PPFA Chapter Facebook page and had Chapter business cards made for suppliers and members to distribute. For the past nine years she has led visits to museums, organized innovative meetings involving suppliers, and works with suppliers to bring in new members. Under her direction, the Chapter has held tile framing competitions and dessert challenges to involve and inspire members. Last year, Sue chaired the Chapter Relations Committee and spearheaded a very successful Chapter Leaders conference. She currently serves on the Consumer Awareness Committee and the Membership committee. To see recipients of other PPFA Service Awards. Congratulations to Lauren Rosenthal of Ampersand Projects in Lambertville, NJ for being a recipient of the L.Thomas McKeon scholarship. The Scholarship is awarded annually to 5 framers for a set of CPF-recommended study books and a sitting for the exam. We wish her luck on the exam! Applications must be received no later than September 15 for scholarships for the following calendar year. Current PPFA members or employees of member businesses may apply. For more information on PPFA’s certification program, refer to the PPFA National website. Metro Atlantic PPFA welcomed Greg Perkins to Pennsylvania on September 22, 2013. Framers learned how to create a signature style for their shops. Tours were also given of the Larson Juhl facility. Patrick Sarver, editor of Picture Framing Magazine, had Greg’s books for purchase. Thanks to Larson Juhl for donating fabulous door prizes and for having Metro Atlantic PPFA as their guests. Thanks to Tru Vue for providing the attendees with glass specifiers. A special thanks to Ron Douros for taking photos throughout the day. Please view our slideshow of the day. Thanks to the Don Mar Family for hosting a wonderful event for framers and vendors in Cherry Hill, NJ. 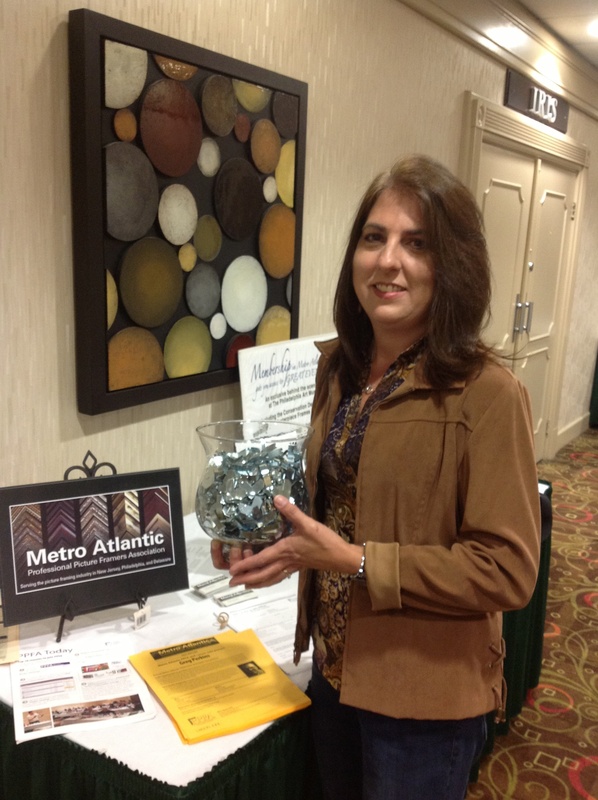 Congratulations to Debbie Rice, owner of Friendship Framing of Bath, Pa who correctly guessed the number of AMS frame hardware in the vase at our table at the Don Mar Open House on Sunday September 8, 2013. The correct amount was 776 and Debbie came closest by guessing 743. Debbie won a Staples Gift Card. Thanks to Sue Erickson, Don Mar representative for helping us with the contest. Thanks to all who stopped by our table and to Don Mar for graciously sponsored this event. Metro Atlantic PPFA thanks Evonik Cyro for hosting a top notch event on May 13, 2013. The framers and sales reps learned about acrylic product offerings from an informative presentation from Don Berg, Vice President of Gemini Moulding. Many Evonik Cyro staff joined the PPFA Members for the day, adding information from their areas of expertise. PPFA members learned about the history of the company, the different types of acrylic, and how to clean, score and fit. The framers got to network during a delicious lunch. Thanks to Evonik Cyro for hosting and presenting our latest Metro Atlantic PPFA meeting. Congratulations to all who entered our Dessert Competition. We received tasty entries from Hedy Kulka, Ann Butwinski, Penny Safane and Carla Bates. Penny Safane from Frametastic had best presentation for her sparkling photo frame cake and Carla Bates of The Frame Shop had the best flavor for her luscious chocolate mocha cake. Our dessert judges were: Brian Grider from TruVue, Amy Sudol writer for Picture Framing Magazine, and Gritsko John Klein of M&M Distributors. Below are a few photos from the meeting. October 2012-Thanks to Len Lastuck of KoolTack for putting on a great meeting for us on September 30. The meeting was well attended and everyone left with some new techniques. Thanks to our sales reps for attending-Sue and Patrick from Donmar, Dolores from Turner and Cliff and Penny from Frametastic. October 2012-Be sure to sure to check out the Competition page for results of the Print and Open Competitions. Congratulations for all who entered: Nicole from Rose City, Dan from Windsor Gallery, Carla from The Frame Shop of Conshohocken, and Michelle and Christine from Wallflowers. They were all fantastic entries. We can post photos as of February 2013. October 2012- We just collected seven framed pictures to be donated to Deserving Decor for folks starting new homes. Also we have 13 more pictures waiting to be picked up. At our last meeting, we had a lovely donation of some gorgeous prints that need to be framed. We’ll need a few volunteers to get these done. Thanks to Carla, Sue, Dolores, Jacie and Sr. Linda for brightening up the apartments for those in transition. Little things make a difference! September 2012- We collected boxes of mat scrap donations at our last meeting. These are for children’s art classes at the Center for Contemporary Art in Bedminster, NJ. Thanks for taking the time to gather your scraps. They are appreciated. August 2012- Congratulations to Lisa Dromsky CPF! A hearty congratulations go out to Metro Atlantic PPFA’s latest CPF, Lisa Dromsky. She was the recipient of the L. Thomas McKeon scholarship last year receiving the full set of study books and the exam fee. A job well done, Lisa! August- 2012 Monmouth Museum Meeting Thanks to all who participated in the Monmouth Museum Meeting on August 6, 2012. Thanks to Nancy Haulenbeek for filling us in on the field of Appraising. A link will be available to her presentation in the near future. The Monmouth Museum was a great host and we appreciate the amazing meeting place and tour. A special thanks to Dan Fenski for arranging the meeting with the Museum. Enjoy the slide show! Metro Atlantic PPFA Needs Your Help. We’re trying to send out email and snail mail notifications from within the Chapter and not by National. We need to have accurate contacts. If a large company belongs to PPFA, only one email per company is sent out if sent by National. If there are local sales reps they wouldn’t hear about our events. So here is where you can help. Are you a sales rep? Please send us your contact information so that we can include you. If you are a member shop, feel free to give us the contact information of your favorite sales reps in the industry, so that we can invite them to meetings. Do you know a shop that might be interested in attending? If you get us the information, we will follow up. We promise that we won’t bombard anybody with too many emails or postcards. Thanks for making Metro Atlantic PPFA one of the best PPFA Chapters! Here’s our contact page. Do You Want Quality Educational Events? We sure do! But sad to say, if you don’t RSVP, sometimes your officers are forced to make the call to cancel a great event. Our last meeting at the Photography Museum was postponed because of a small amount of folks that responded. It was a great venue and some thought that they might show up at the last minute. Not knowing this, we had to make the call because it didn’t look like a great number would attend. Our Chapter has a large pool of the best framers in the tri-state area. We will grow by keeping our group active. Please join us at the next event and please commit early. Don’t worry, you’ll have a fun time and the door prizes are always great! Thanks to Don Mar for providing Metro Atlantic PPFA with a display table at their Open House on June 24, 2012. As always Jay Goltz was an informative speaker. Both framers and suppliers got the chance to interact and share new ideas. Thanks for supporting our industry, Don Mar! November 2011-Congratulations to Lisa Dromsky of Night Owl Design for being the recipient of the L.Thomas McKeon CPF scholarship. The Scholarship is awarded annually to 5 framers for a set of CPF-recommended study books and a sitting for the exam. Applications must be received no later than Sept. 15 for scholarships for the following calendar year. Winners will be named on or before Oct. 31. Current PPFA members or employees of member businesses may apply. For more information on PPFA’s certification program, refer to the PPFA National website.